The Vampire and Venom were the first jets in service with Iraq. Iraq - The R. Iq. AF.- was able to get the first jet aircraft in 1953 after it was received 12 of the aircrafts type de Havilland DH - 100 Vampire FB.Mk.52 and six other planes Vampire T Mk 55 two-seater. And to enter this era of jet aviation for the first time. The aircrafts have been delivered belong the No. 5th squadron based in Al-Rasheed Camp air base / Baghdad. In 1954 the Royal Iraqi Air Force was received 19 aircrfts type de Havilland DH 112 Venom FB Mk 50 and they have been belong the No. 6th. squadron based in Habbaniyah air base. DH 112 Venom FB Mk 50 -RIqAF. Advanced or basic training ? Iraq used these planes both aircrafts in light bomber and attack role within the No. 5th, and 6th sqs. until the arrival of the first batch of aircraft Hawker Hunter F Mk 6 (15 aircrafts) where re-equipment within No. 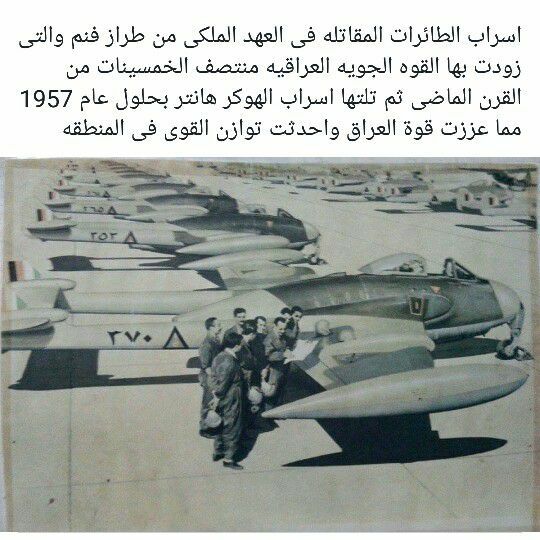 6th sq.When were transferred Vampire aircrafts to the Iraqi Air Force College, as advanced training aircraft, it probably remained in service until the mid-sixties of the last century. As of 1956, Vampires of No.5 were already handed over to the Flying Colege, and replaced by Venoms of No.6 Squadron (which in turn re-equipped with Hunters). The Flying College had at least three Vampire T.Mk.55 two-seaters and several single-seaters until around 1965, although in 1962, at least one two-seater and two single-seaters were donated to Somalia. Meanwhile, in 1959 all the surviving Venoms of No.5 Squadron were handed over to No.1 Squadron, then based in Mosul, and replaced by MiG-17Fs. The No.1 Squadron was a unit specialized in COIN, and previously flying Fury FB.Mk.1s. This unit continued flying Venoms in war against Kurds until 1966, when all planes expired their flying hours and No.1 Squadron was (temporarily) disbanded.